Zelacom has built and maintained two websites for Jillian Medoff since they began working together in 1996. 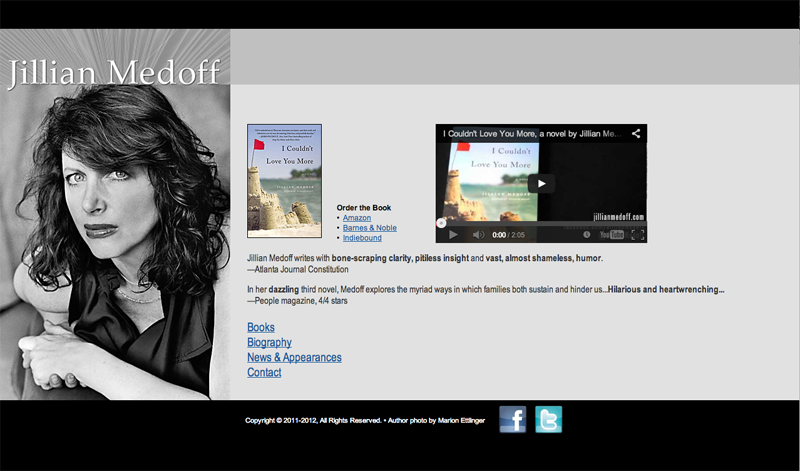 HungerPoint.com was designed to build enthusiasm for the author and readership for Jillian Medoff’s first book, Hunger Point. The website’s design got its inspiration from the narrator’s brash, confessional voice. The website included interviews, reviews and a forum where site visitors could chat with Jillian and one another, building a community readers that helped Hunger Point become a bestseller. HungerPoint.com was taken offline when Jillian produced her second novel; in its place we built JillianMedoff.com. The design is clean and sophisticated, hosted by a third party, and maintained jointly by Zelacom and Jillian herself.